I really struggled with the name of this post. They’re basically a brookie, since they’re part brownie, part cookie. But when I hear brookie, I think of cookie cups or bars…and these beautiful swirled cookies deserved a different name! This recipe combines the two cookie batters, a decadent brownie cookie batter, and a browned butter chocolate chip cookie batter. 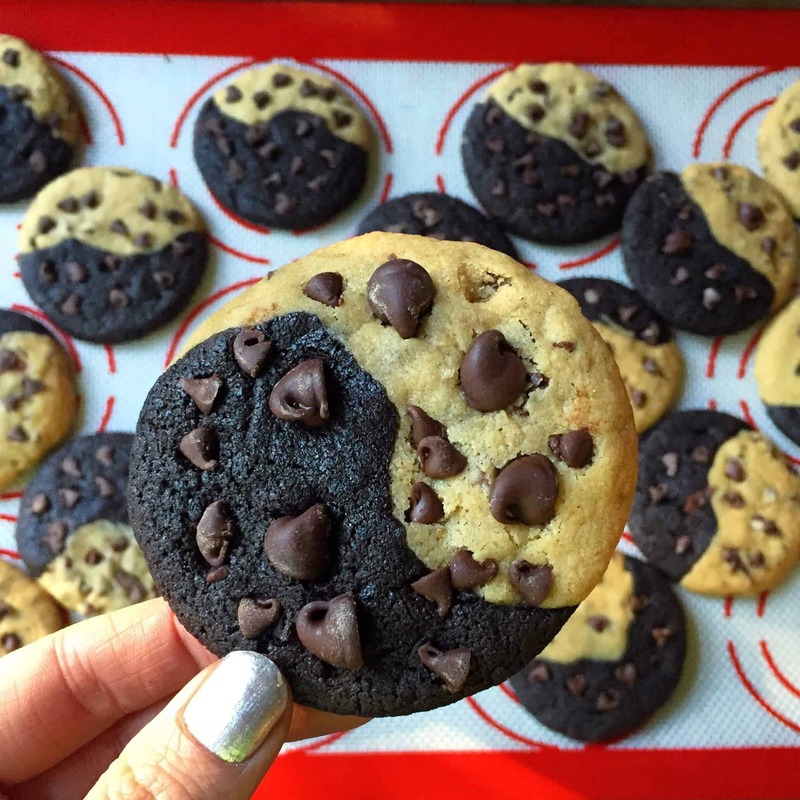 Two balls of each dough are rolled together to create these wonderful swirled cookies. The recipe I used listed below. First, make the browned butter cookie dough. Whisk together the flour, baking soda, and salt in a bowl and set aside. Melt butter in a saucepan over medium heat. The butter will begin to foam. Make sure you whisk consistently during this process (or else little bits on the bottom of the pan will burn!). After a couple of minutes, the butter will begin to brown on the bottom of the saucepan; continue to whisk and remove from heat as soon as the butter begins to brown and give off a nutty aroma. Immediately transfer the butter to a bowl to prevent burning. Set aside to cool for a few minutes. With an electric mixer, mix the butter and sugars until thoroughly blended. Beat in the egg, yolk, vanilla, and yogurt until combined. Add the dry ingredients slowly and beat on low-speed just until combined. Gently fold in all of the chocolate chips. Allow dough to chill dough for 2 hours. Next, make the brownie cookie dough. Cream the butter and sugars together with a hand or stand mixer on medium speed until light and fluffy. Scrape down the sides and bottom as needed. Beat in the egg and vanilla until combined, scraping down the sides as needed. In a separate bowl, combine the flour, cocoa powder, baking soda, and salt. Slowly mix it into the wet ingredrients. The dough will be quite thick. With a rubber spatula, mix in the milk and then fold in the chocolate chips. Allow this dough to chill for about 1 hour. Preheat oven to 350F degrees. Line cookie sheet with silicone baking mat or parchment paper (I prefer a silicone baking mat!). Measure 2 Tablespoons of browned butter cookie dough, and roll into a ball. Take 2 Tablespoons of brownie cookie dough, and roll into a ball. Swirl the two balls together,rolling them into 1 large ball. Repeat for each cookie. The chocolate cookie dough will stick to your hands, so wash/wipe them as needed throughout the process. It is important the chocolate cookie dough is chilled, or else it will be even harder to handle. Bake the cookies for 11-12 minutes. The cookies will be soft and barely set, but they will continue to set and bake as they cool on the baking sheet. I like to press a few more chocolate chips into the top of the cookies when they are still warm, to make them prettier. 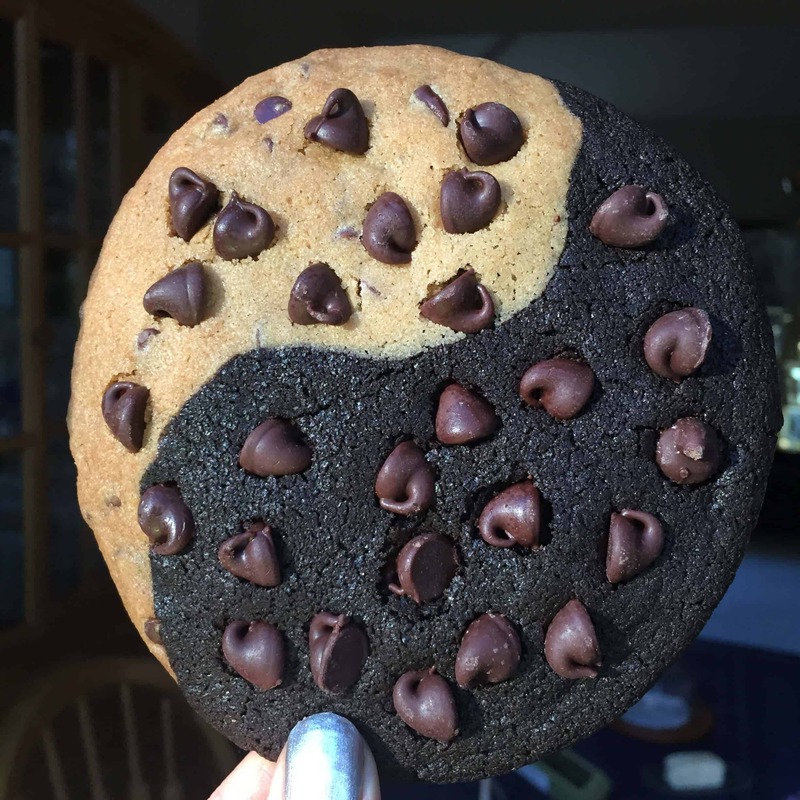 I got tired of swirling together cookie balls towards the end of the process, and make one giant swirl cookie for fun. I use two tennis ball sized portions of dough, and baked for about 20 minutes. These cookies last up to 10 days in an airtight container. I am curios how all of your cookies are so perfectly round? Mine never come out that nice!